Bread Trap is Ashley's boss microgame in WarioWare: D.I.Y. The point of the game is to make a sandwich out of three ingredients. There are two slices of bread across from each other. 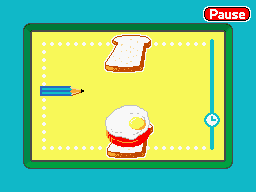 When the player taps the screen, the two slices of bread come together, making a sort of trap. If one of the ingredients gets caught in the trap, the food item automatically becomes part of the bread. However, there are some non-food items that go across the screen too. The food items include lettuce, tomato, a hamburger patty, and an egg. The non-ingredients are a tire, a caterpillar, and a pencil. The player needs to trap three food items in order to win the game. Two or even all the food can be of the same item. However, if time runs out or the player traps a non-food item, the game ends in a loss. This page was last edited on July 17, 2018, at 09:23.